A few recipes that we've tried and loved: Strawberry Preserves (yay for having fresh strawberry jam - will be saving some jars for winter) and Strawberry Cobbler (absolutely.wonderful.). Another I will try today is Strawberry Lemonade Concentrate (you can make your own?! I'm so excited about this one). These strawberry preserves are fabulous. A little time-consuming to make, but well worth it. I'm not one who cans a whole lot (I wish I was, working on that...) so I was a little intimidated about canning the preserves, but it was actually fairly simple. There are a lot of tutorials online about canning and different methods. I chose what seemed to be the simplest - turning the jar over once the hot preserves are in it (and the lid on of course) and letting it seal itself (read below). I made jam last year using this method and it worked. 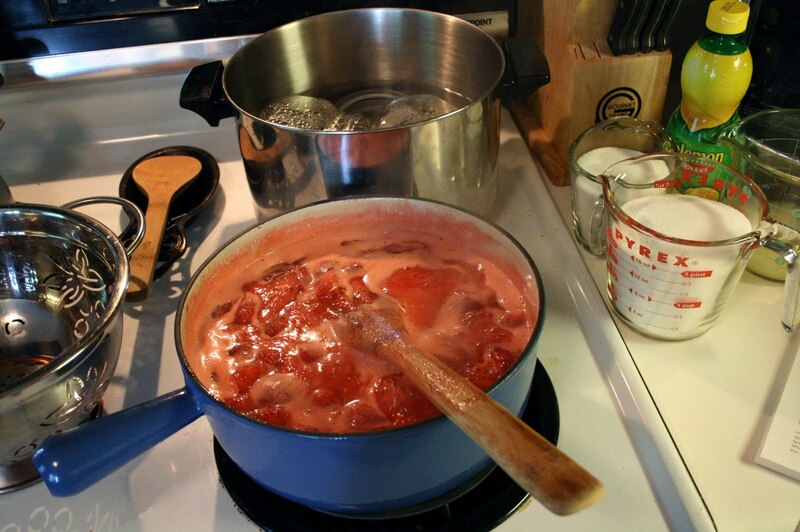 In a large saucepan, cover berries with boiling water; let stand 3 minutes to soften. Drain water and discard. In a large stock pot, place canning jars, lids and rings and fill with enough water to cover completely. Bring to a slow boil. This will sterilize the jars and lids. I let mine slow boil while I was working on the preserves. Combine berries and 3 cups of the sugar in a 6 to 8 quart saucepan. Bring to a boil over high heat, stirring constantly. Reduce heat; continue to boil slowly on medium heat 8 minutes, stirring constantly. Add remaining 3 cups sugar and lemon juice. Boil 10 minutes more, stirring constantly. Using a candy thermometer, bring to the jelling stage of 220-225 degrees F.
Remove from heat. Stir and skim off foam with metal spoon for about 2 minutes. Remove one jar, lid and ring from the boiling water with tongs and place on a clean, dry towel. Ladle hot preserves into jar and leave about 1/4" headspace at the top. Wipe the mouth of the jar with a clean cloth, place the lid and ring on and close tightly (not too tightly, but not loosely). Turn the jar upside down (Be careful! The jar as well as the preserves inside are HOT!). Repeat with remaining jars until finished. Wait an hour before turning the jars back over. Be sure to check the the top has inverted down and doesn't move when you press on it. If it does, you need to try again with sealing it. *You can skip the processing part if you would rather freeze the concentrate. Freeze in 1 to 2 cup portions. 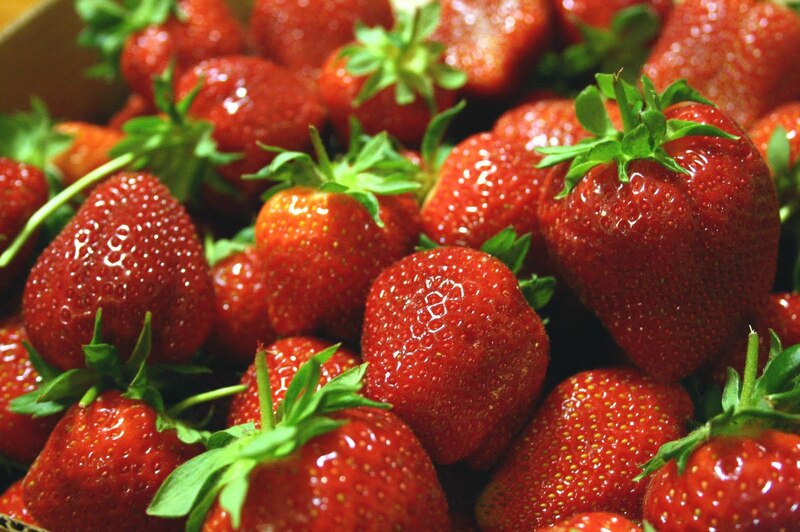 Purée strawberries in a blender or food processor until smooth. Mix berries, lemon juice and sugar in a large pot and heat to 190 degrees F, stirring occasionally. Do NOT boil. Ladle concentrate mixture into hot, sterilized jars (boil jars and lids to sterilize- see recipe above about sterilizing jars), leaving about 1/4" headspace at the top. To process, place closed jars of concentrate in a boiling water bath (covered completely with boiling water in pot) for 20 minutes. EDITED AGAIN: Ok, so I made the recipe today (4/29/10) and have a couple of adjustments and tips that I found worked well. I followed the recipe and ended up canning 4 pints worth in pint jars, and instead of doing the boiling water bath as suggested, I tried the "flip the jar over once it is full and the lid is on tight". And they sealed perfectly! Much easier than doing the water bath (for me it was easier, I don't have a stock pot big enough to do the water bath in). looks yummy! However our farm charges a very high price on pick your own - which I do not understand. Yippee skippee! I love canning. It is a lot easier (for me) to do with a friend. Just one question: How much concentrate per cup of water for strawberry lemon-aid? Thanks for the post! i love the idea of freezing the concentrate. we drink lemonade all summer long! I had a conversation last night about how I wanted to pick strawberries and make jam...that it's next on my list! How awesome to find your directions here, today! Which berry farm did you go to? We went to one last year...I think it was called the Collard Patch, but I'm not certain. Love these ideas. I have been wanting to make jam forever but never have. I'm going to try it out. Thanks!